Santa Throne chair ideal for taking pictures and an excellent Christmas Holiday display decor prop. It is durable and has a luxurious look. 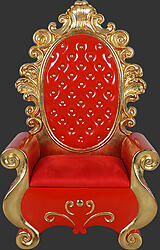 This Santa Clause throne chair is hand painted in red and gold. It will have huge impact in your Christmas shop window display and is ideal for all businesses with a Christmas decor theme. It is used for Christmas home decoration or commercial Christmas decoration like malls, restaurants, coffee shops, children?s farms, zoos, theme parks etc to decorate and promote Christmas events, activities and parties. Made from durable resin mixed with fiberglass.